Ready to deepen your own practice? Interested in studying with dynamic teachers? Are you ready to take the next step to advance your teaching? Have a thirst for more depth and knowledge to bring to your students? This Exceptional Intensive Training with premier teachers from the Bay Area will provide all of that and more! This program is registered with the Yoga Alliance as a 300 Hour Teacher Training Certification Program to add to your 200 = (RYT-500). Only $18/ per class hour or less if early registration is applied. Amazing staff members including -Jean Grant-Sutton, Baxter Bell, Mitchell Kauk, Tony Briggs, Anne O’Brien, Anodea Judith, Deacon Carpenter, Rhonda Gerhard, Deb Reid, Cheryl Thomas and more. 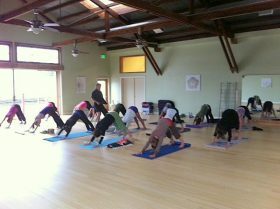 On completion of this training you meet standards for an advanced yoga teacher. You receive a certificate of completion and can fill out the application for the National Registry of Yoga Teachers(RYT-500) through Yoga Alliance. to advance beyond the fundamentals and strengthen your teaching and knowledge of the ancient art and science of Yoga. Sharpen your skills at class design, sequencing, pacing, and adjusting. Refresh and progress your understanding of anatomy and physiology. Increase your potential to work with limitations, modifications and other special population needs. Study to employ more of the psychology and philosophy of yoga into your classes. Learn the business and marketing of yoga classes, retreats, workshops and more. A Creative, Comprehensive, Contemporary Course! Sign up now for program starting January 5th, 2019. Register early: class size is limited! DOWNLOAD YOUR REGISTRATION FORM right click on the form to save it on your device. Complete the form and email to Jean, or mail it to address on the form. We look forward to having you in the training! Jean has the dream to support the vision of Integrative Yoga by making it accessible to all, especially those who can’t take large amounts of time away from family or work to do the two-week intensive programs. She aims to create a non-judgmental, non-competitive learning environment where the student feels free to explore all the aspects of yoga. Her format is set-up for the students to have a lot of direct experience, practice, discussion, instruction and healing. Her intention is to give the student the ability to facilitate classes of their own with confidence and enthusiasm for this ancient art of self awareness. Jean has completed the Integrative Yoga 1000-hour Advanced Professional Yoga Therapy (certification) Program. Her main teachers include Kate Pelly (Iyengar), Ian Rawlinson (Desikachar-ViniYoga) and Joseph LePage (Integrative). She has also been influenced by classes with Scott Blossom, Richard Miller, Anodea Judith, and Judith Lasater. She is a Certified Massage Therapist and Nutrition Consultant and studied Health Education at San Francisco State University. Jean was the Founder and Director of BodyWorks-Integrative Yoga and Stress Management Center. She has been practicing and studying Yoga since 1980 and teaching since 1994. Jean’s teaching encompasses her extensive experience as a bodyworker (Certified Massage Therapist), and her passion for yoga. She is currently Program Coordinator and teacher at P.O.S.T. Wellness by Design in Petaluma. Anne O’Brien is passionate about the practice of yoga to enhance lives. Anne has practiced yoga for over 20 years and has trained hundreds of teachers. She is a Registered Yoga Teacher at the Advanced level with the Yoga Alliance offering multi-level group classes, private lessons, therapeutic work, intensives, workshops, retreats, and yoga teacher training courses. Her instruction offers a blend of precise technique, creative innovation and a dose of humor. Classes are a rich, physically challenging experience that emphasize alignment, cultivate a focus on the breath and conscious awareness, encourage individual modifications, and offer nuggets of yoga philosophy. The practice encourages a full being spiritually uplifting experience. I began my yoga studies in 1978, almost 40 years ago. From the beginning until 2002 I studied at length with senior Iyengar Yoga teachers such as Judith Lasater, Manouso Manos, Kofia Busia, and Ramanand Patel. On several occasions during that time I had the great good fortune to be able to study directly under the watchful eyes of BKS Iyengar and Geeta Iyengar, both in India and here in the U.S. My personal practice and experiential understanding of the art of yoga have grown and deepened profoundly from all these teachers’ years of generosity, knowledge and acumen. I myself began teaching in the San Francisco Bay Area in 1985, over 31 years ago. I have taught weekly, on-going public classes, workshops, retreats, various teacher-training programs, and advanced teachers’ consultation groups. Nan Herron, M.D., a psychiatrist specializing in post-traumatic stress disorder, has spent the past 25 years working with individuals on locked in-patient psychiatric units by combining traditional western medicine with mindfulness and yoga. She is a certified yoga teacher and is trained in various techniques including Eye-Movement Desensitization and Reprocessing, Mindfulness-based Stress Reduction, Mindful Self-Compassion, Trauma-informed Mind-Body Program and Positive Neuro-plasticity training. She teaches trauma-informed yoga and somatic interventions for PTSD throughout the US and internationally. Anodea Judith is an international workshop leader, yoga teacher, therapist, filmmaker and author of many books on the chakras. She’s considered one of the country’s foremost experts on the combination of chakras and therapeutic issues and on the interpretation of the chakra system for the Western lifestyle. Anodea’s background includes a Master’s degree in Clinical Psychology from Rosebridge School of Integrative Therapy, a doctorate in Health and Human Services, (focused on mind-body health) from Columbia Pacific University, with additional doctoral work in Systems Theory at Saybrook University. Mitchell Kauk, PT, OCS is the director of P.O.S.T.-Wellness by Design. Mitchell has been a practicing physical therapist for more than 30 years, treating orthopaedic & sports injuries primarily. He emphasizes manual therapy and a holistic approach which individualizes treatment for each patient and incorporates acupuncture, biofeedback, chiropractic, feldenkrais, massage, and pilates as needed. Mitchell opened Petaluma Orthopaedic & Sports Therapy in 1989 and has treated over 10,000 patients and clients from the greater Petaluma area. He was the first physical therapist in Sonoma County to be board certified as an Orthopaedic Specialist (OCS). In addition, he is a Registered Yoga Instructor (RYT) and incorporates yoga principles in a patient’s treatment plan when appropriate. Rhonda Gerhard is a Certified Integrative Yoga Therapy Teacher and a Psychotherapist since 1992. She joyfully brings the integration of mind, body and spirit to her work with others. For more information go to www.rhondagerhard.com. Deb Reid is noted for her compassionate lighthearted yoga teaching RYT500 and yoga therapy C-IAYT. Her work is focused in addiction recovery at Five Sisters Ranch, laughter yoga programs with seniors in independent, assisted, and memory care facilities, her private practice and facilitating silent retreat days of yoga and meditation. Some of her mentors are Janice Gates, Rich Hanson, Judith Lasater, Richard Miller, Anodea Judith, Prashanti de Jager, Deanne Adamson, Nikki Meyers, Kyczy Hawk, Lori Jean Glass. She has taught on the Spirit Rock Meditation and Yoga Training and assisted Rick Hanson in his Buddha’s Brain retreat. As a 500-hour yoga instructor and certified Yoga Therapist (C-IAYT) with 15 years of teaching experience, Cheryl Thomas brings education, personal practice and experience to her teachings. She specializes in Restorative Yoga training following her belief that one of the most important things we can do is to rest. 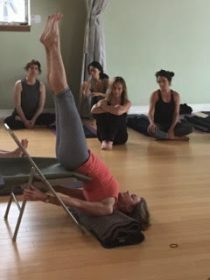 She has studied at the basic and advanced levels with Judith Hanson Lasater and Roger Cole in the physiology of restorative yoga and the supported poses that bring deep rest. She has had the opportunity to teach at 3 NIH funded studies at UCSF studying the effects of restorative yoga. Additionally, Cheryl is a graduate of the Institute of Holistic Studies at San Francisco State University. You can connect with Cheryl at her website www.cherylthomas.com. In 2009, Deacon obtained his certification as a Clinical Ayurvedic, and moved from New York City to establish his practice in Sonoma County with his partner, Ginger Schechter, MD. Although specializing in gastrointestinal disorders, Deacon works with patients from every walk of life who have many unique health conditions. He believes an accessible approach to Ayurveda is key to achieving and maintaining a healthy lifestyle.